As part of human exploration of the Moon, numerous space missions have been undertaken to study Earth's natural satellite. 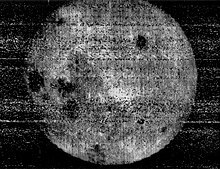 Of the Moon landings; Luna 2 of Soviet Union was the first spacecraft to reach its surface successfully, intentionally impacting the Moon on 13 September 1959. In 1966, Luna 9 became the first spacecraft to achieve a controlled soft landing, while Luna 10 became the first mission to enter orbit. ^ Rincon, Paul (7 December 2018). "China mission launches to far side of Moon". BBC News. Retrieved 9 December 2018. ^ "PTScientists 'Mission to the Moon' to take care not to harm Apollo 17 landing site | collectSPACE". collectSPACE.com. Retrieved 9 December 2017. ^ Toyota, Hiroyuki; Nishiyama, Kazutaka; Kawakatsu, Yasuhiro (15 August 2017). "DESTINY+: Deep Space Exploration Technology Demonstrator and Explorer to Asteroid 3200 Phaethon" (PDF). Low-Cost Planetary Missions Conference. Retrieved 21 September 2017. ^ "#dearMoon". #dearMoon. Retrieved 18 September 2018. ^ Parnell, Brid-Aine. "Non-profit Moon Mission Falls Foul Of The Crowdfunding Tax Conundrum". Forbes. Retrieved 27 January 2019.